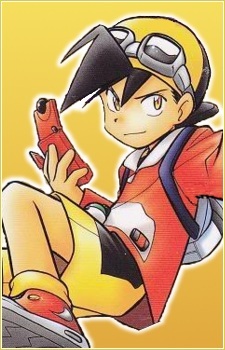 Gold is the fifth main character of the manga series Pocket Monsters Special. His starter Pokémon is a Cyndaquil which he "borrowed" from Professor Elm; what his actual first Pokémon was is not clear, since he grew up in a house full of Pokémon. His neighbors in New Bark Town refer to his family as the "Poké House." He likes playing billiards, but sometimes he may use his Pokémon to cheat. His favorite idol/DJ is DJ Mary from the Goldenrod Radio Station. He usually wears a pair of goggles and travels on a skateboard. Instead of throwing/kicking his Poké Balls, he uses a billiard cue to shoot them out. Gold's hobbies include gambling, skateboarding, and trying foods from different cities. Professor Oak noted that while Red had some odd habits, Gold is much more immature and mischievous. Gold's mother has described him as "careless." Gold's special skill, as described by Professor Oak, is Pokémon hatching and is known as the "Breeder" (孵す者). He has the ability to draw out the largest potential of a baby Pokémon, having lived with Pokémon his whole life.